When it comes to eating your food between two slices of bread in New Orleans, the po-boy clearly reigns supreme (and really, how could it not? 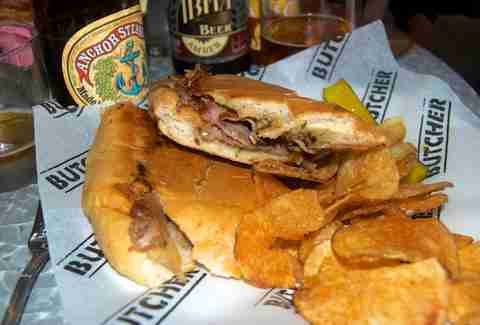 ), followed very closely thereafter by the muffaletta. But after that, things really get interesting, as not all great sandwiches in the Big Easy necessarily come on French bread or a muffy loaf. 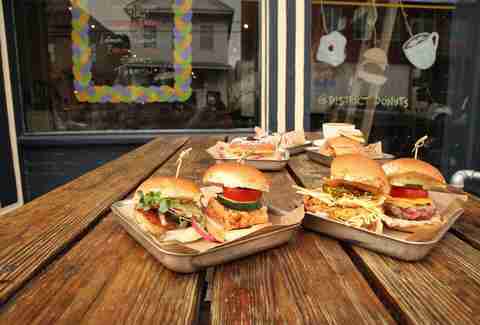 If you’re looking to engage in alternative sandwich excellence, here are some of the best in town right now. The inventive donut creations at DISTRICT might have people flocking to its Magazine St store -- maple Sriracha with candied thyme (!!!) -- but you’d be remiss to skip out on the perfect little sliders there, as well, which feature house-ground Creekstone Black Angus beef. Employing the eponymous Wisconsin cheddar, the Hooks at St. James also sports house-smoked turkey, fresh basil, tomato, mayo, and avocado on fresh ciabatta. It’s delightful. Trust us. 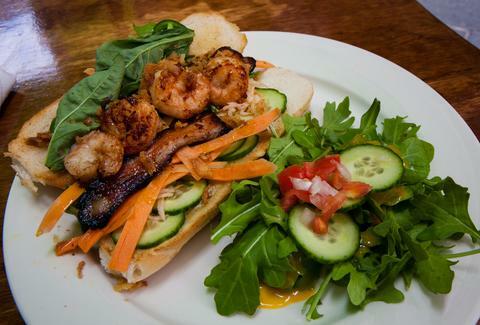 Although New Orleanians tend to refer to the banh mi as a “Vietnamese po-boy,” it is its own sandwich in its own right. 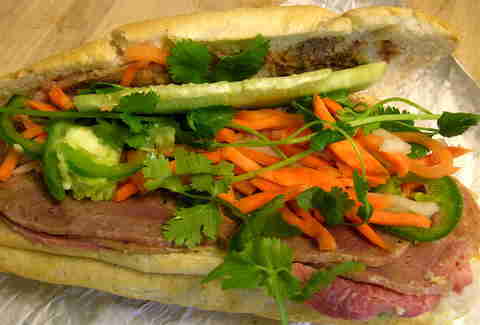 It’s hard to beat the classic out at Dong Phuong bakery. 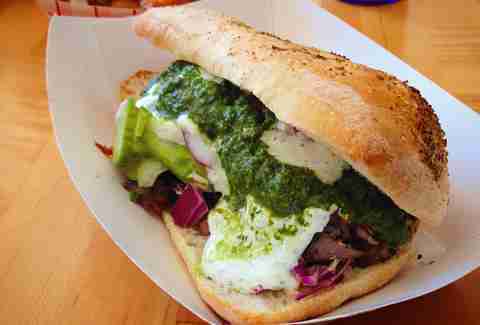 Fancy ‘wiches are the hallmark at Wayfare and it’s difficult, if pressed, to choose a favorite. "The Knuckle” is always a crowd pleaser with its combo of rare roast beef and horseradish, but don’t miss the Porchetta: pork loin wrapped in Kurobuta pork belly, caramelized onions, salsa verde, arugula, and fennel aioli on a hoagie. Yes, a hoagie. Not a po-boy. Although Kebab only opened recently and it's serving through the weekends alone, it’s worth a trip over to St. Claude Ave in order to experience its dynamite Dutch/German/Turkish street food, particularly its version of the gyro, made here with Chappapeela Farms pork and dressed up with tzatziki and skhug sauces, pickled onions, and cabbage. Those in the know realize that the muffaletta at Donald Link’s snack shop is one of the best in the city. 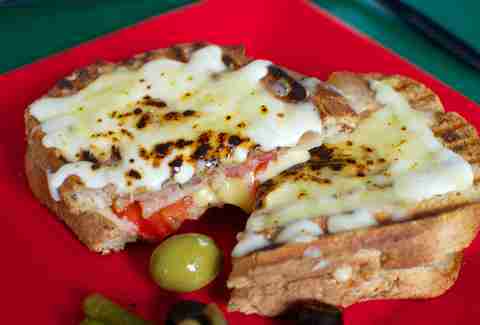 Slightly less known, however, is its fantastic classic Cubano. Though not really known for its Jewish delicatessens, New Orleans does indeed have a rich Hebrew heritage, which can be enjoyed at Stein’s (along with a killer beer selection). The Rachel -- a Reuben variant featuring pastrami instead of corned beef -- hits the mark every time. 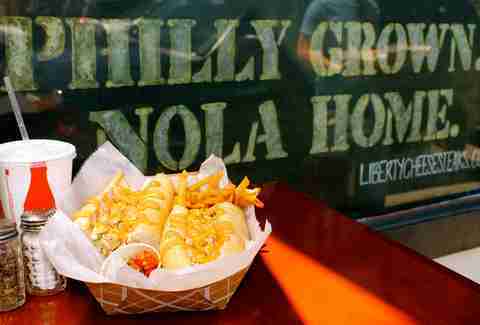 It may have taken some decades, but hungry New Orleanians can now find a solid, true-to-Philly cheesesteak, and thank goodness for that. Skip the variants and go with the classic Wiz, just like you’d find in the city of Brotherly Love: loaded with steak, onions, and gooey, bright, yellow Cheez Whiz. This Rampart St sandwich shop bills itself as “Fast French,” and proves it with these delicious “Hot Les Sandwiches,” which employ savory fillings (beef, ham, chicken, andouille, etc.) and thick gobs of blowtorch-melted cheese. Neil McClure knows his way around some classic American BBQ, and there’s no doubting that. 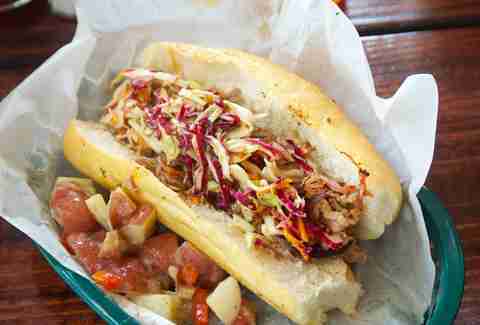 If you’re headed to his Magazine St spot, you’ll have your eye on the awesome chicken (with white, Big Bob Gibson-style Alabama sauce), but don’t let that keep you away from the spot-on pulled pork, especially when paired with vinegary NC-style sauce. Yes, everyone knows -- or should know -- that Casamento’s is the place you want to go to satisfy that raw oyster jones. 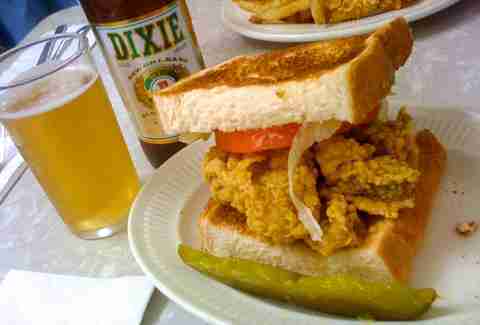 On top of that should also be added its famous fried oyster “loaf,” which would be a po-boy if it were served on French instead of thick slices of buttery Texas toast. Okay, so this one is, in fact, served on Leidenheimer French bread. 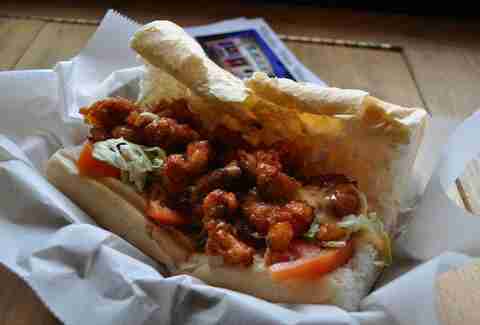 But this alone does not make it a po-boy! It seems impossible that a tempura-fried lobster sandwich hasn’t been done everywhere at this point, but The Sammich grabbed that (insanely good) idea and ran with it... with spicy mango cream.